Monica Porter joined the Youth and Shelter Services (YSS) board of directors in 1999 and has served continuously since that time, including three years as Chair. In 2000 Monica was elected to the YSS Board of Trustees and after serving the maximum term, she was elected an Emeritus Trustee by her fellow Trustees to honor her service. Porter always answers “whatever I can do to help,” whenever she is asked to serve. Co-chair of the Planned Giving and Deferred Gift Committee for the 1995-96 Preserving the Past – Preparing for the Future campaign to remodel and equip the Ames Municipal Building into the YSS headquarters. Co-chair of the 2001-2006 Endow the Future YSS endowment campaign. Campaign Cabinet member for the 2006-09 YSS Family Life Center Building and Endowment campaign to remodel the Family Life Center. Current Chair of the YSS Dr. George’s Founder Legacy Fund fundraising committee. ​The skills and expertise developed while working at the ISU Foundation Planned Giving Department combined with her strong gift for leadership have led to helping every one of these campaigns exceed its fundraising goal. Monica and her husband Max quickly step up during each campaign and make significant contributions to the fundraising efforts through both planned giving and the annual Friends campaign. In addition to her service at YSS, Porter serves on the Ames Public Library Friends Foundation Board of Directors and was active in the library’s new building campaign. She was on the steering committee of Leave a Legacy Iowa, an effort to encourage Iowans to make planned gifts to non-profits through their estates. Porter has served twice as president of the Ames Noon Rotary Club and president of the Sawyer Parent Teacher Organization. She has served Collegiate Presbyterian church as both a deacon and an elder. Porter is unassuming and does not actively seek recognition, yet her quiet spirit of commitment, competence and leadership enhances all the organizations with which she is associated. In recognition of her fundraising efforts, she received the Spirit Award from United Way of Story County and the Outstanding Volunteer Service Award given by the State of Iowa. 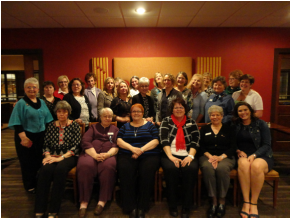 Altrusa International of Ames, Inc. is a service club committed to improving our community through a variety of events, volunteer opportunities and fundraising for Ames non-profits for 50 years. There are currently 35 members committed to philanthropy, the philosophy of unselfishness and the joy of giving rather than receiving. Altrusa holds two main fundraising events each year. The Holiday Home Tour, celebrating its 27th anniversary this year, will raise funds for United Way's Backpack Program, Ames Historical Society and Heartland Senior Services. The Steppin’ Out Style Show raises funds for service awards for high school seniors, as well as scholarships for study abroad, college and trade school students. ​Ames Altrusans donate their time, talents and funds to a variety of things. For over 5 years they have painted and redecorated rooms for ACCESS as needed. Some members are trained for Emergency Preparedness and can be counted on to respond in a local crisis. Members have been active in the project Totes for Teens, Tweens, and Tots, in which totes are filled with donated items and given to the Youth and Shelter Services Foster Care program or Lutheran Services in Iowa for their client needs. Other activities include sewing headscarves for the Bliss Cancer Resource Center, a Trick-or-Treat for books event at the library, serving a meal for the performers after the Ames Senior Variety Show, adopting a flower garden on Duff Ave, volunteering for Mainstream Living’s Be-Amazing Race and more. 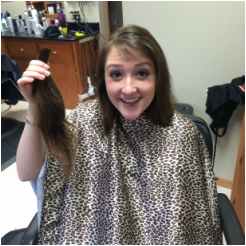 Kate Hulshizer, a 2015 graduate of Colo-Nesco High School, looks to the memory of her brother as motivation for her work to create a bone marrow initiative aimed at raising awareness about the importance of bone marrow donation. Kate is the type of person that naturally looks for the greater good as she takes initiative to organize change, skills that help her see projects through from start to finish. Kate is a “true future leader for our next generation” according to her high school principal Brandon Kelley. This commitment to a cause drove Hulshizer to spend her early out time during the week of parent teacher conferences to recruit friends and classmates to help encourage parents, faculty and students to join the network during bone marrow sign-up week, an effort that resulted in twenty one additional potential bone marrow donors. ​Hulshizer’s desire and willingness to provide a helping hand to a classmate in need led to another project that got her entire school involved with helping ease the financial burden of medical expenses. With the help of staff from the bone marrow donor network, Kate organized a dodge ball tournament fundraiser in which all funds were generated by students through registration fees, ticket sales, concessions and a donation box. Hulshizer saw this project through from start to finish and showed, yet again, her willingness to give her time, talent, and energy in her commitment to helping others. 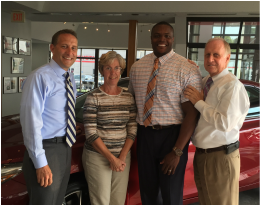 Wilson Toyota Scion of Ames gives back to the community at all levels. They have implemented a philosophy of generosity into their culture, ensuring opportunities for their employees to give back. “We approach our business with a servant’s mentality. Taking care of our community is our number one priority,” shares Danny Wilson, owner. Two specific programs exemplify this philosophy. Beyond their annual contributions to the Boys & Girls Club of Story County, Wilson Toyota Scion of Ames led the charge in providing financial relief to the Club when it was flooded in 2010. Their leadership in the flood restoration project enabled the Club to quickly resume programming for hundreds of children. The second noteworthy program began four years ago with Wilson Toyota hosting a Christmas party for 40 children who live at LSI’s Beloit Residential Treatment Center. Wilson employees annually provide a magical Christmas experience for the Beloit children including Santa, elves, and gifts. In addition to these programs, Wilson Toyota Scion of Ames has donated to a wide variety of Story County organizations and projects, including Ames Christian School, the Ames Education Fund, Ames Parks and Recreation, Boy Scouts of America, Clean Water Movement, Dollars for Scholars, the Octagon Center for the Arts, Friendship Ark Homes, Habitat for Humanity, AHS DECA, Iowa Shrine Bowl, United Way of Story County, Red Cross, Ames Soccer Club, and Lincoln Highway Days. Randy and Liz Hertz (Nevada) and Tom and Joyce (deceased) Hertz (Ames). ​The Hertz family has had a tradition of philanthropic activities in Story County over many years. They have an unwavering commitment to family, land and community. Numerous local community organizations have benefitted from philanthropy and leadership roles. A major recent family project benefitting residents in Story County originated from a bequest of 21 acres of woodland purchased in 1951 by Carl and Marjory Hertz. This land gift to the Iowa Natural Heritage Foundation (INHF) placed deed restrictions on the land that will permanently protect its natural beauty. 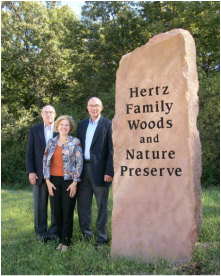 The Hertz Family Woods and Nature Preserve were donated by the Hertz family in memory of Carl and Marjory Hertz and their son, C. Douglas Hertz with the intention of providing a site for public enjoyment. The family developed the area for several years, eliminating invasive species, restoring an area of native prairie grasses and wildflowers and developing erosion control structures. The donation stands out from other land donations in that the Hertz family made significant investments to develop limited amenities, including a one-mile trail around the woodland and a parking lot. They provided rock benches and interpretive signage. Most landowners protect or transfer their land for conservation, yet few landowners go to so much effort to create a public space that is ready to share. The Hertz families continue with philanthropic endeavors most often quietly and without fanfare. Both of the Hertz families have set up donor-advised funds under the umbrella of the Story County Community Foundation. These endowed funds will provide permanent sources of charitable support for the local area now and after their own lives. Jean Kresse from the United Way of Story County shared that “the Hertz Family believes in giving back to their community and they do it in a way that makes a lasting impact."